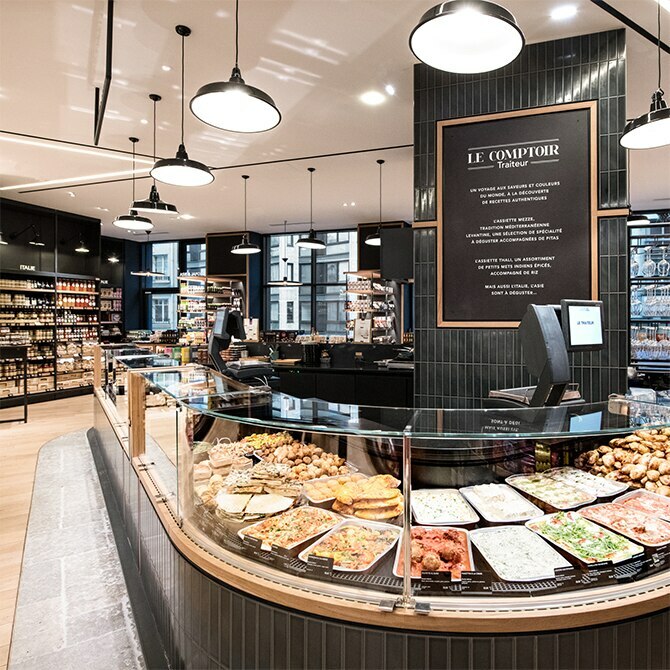 La Grande Épicerie de Paris can now be found on the Rive Droite, with the inauguration of its second store on the lively Rue de Passy. Magnanimity, originality, quality, exclusivity, expertise, discernment, passion... all the values intrinsic to La Grande Épicerie de Paris appear here, plus a few unique features of its own. 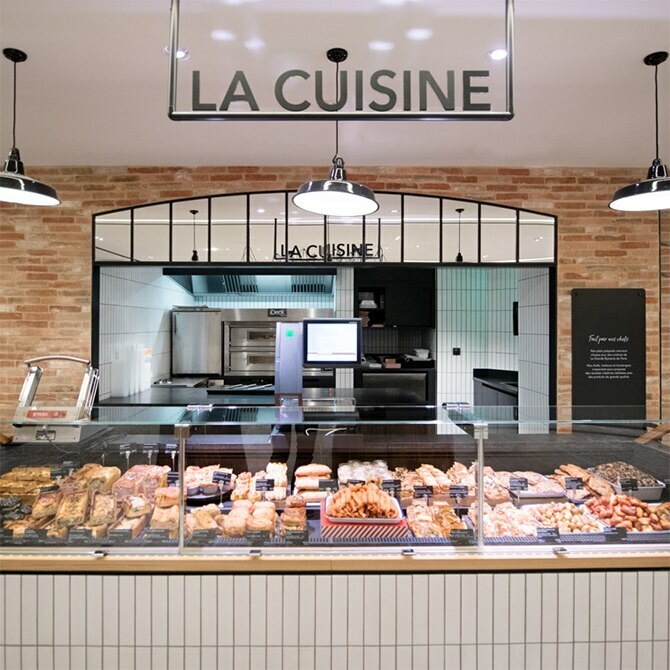 With 6,000 fine food products and the culinary creations of our own chefs, our departments are just waiting to be discovered! 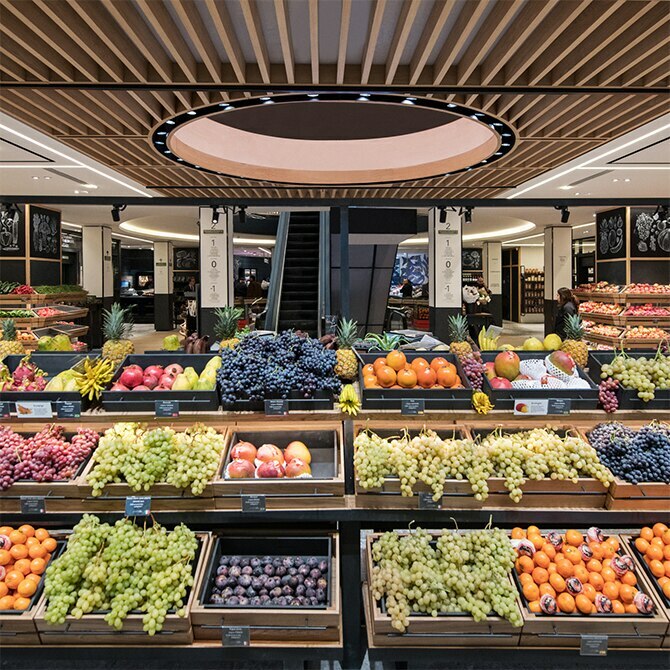 Fruit-infused vinegars, pickled vegetables, flavoured salts, chutneys, mustards, confits... discover our selection of 6,000 food products, bringing together the most emblematic goods from the Rive Gauche. Everything is presented with the same care and attention both on the stalls and on the impressive wall displays, such as our selection of oils imported from Italy, Greece, Uruguay and Spain. Our store also has a few surprises for you, including an array of artisan crisps, condiments, oils and vinegars. On the sweet side, chocolate lovers will be won over by our ‘chocolate library’, with hundreds of bars from the best chocolate-producing countries. While the jam selection, displayed in an alcove the colour of red berries, consists of numerous carefully selected products, including La Trinquelinette and Corsican Anatra jams, and fruit mixtures produced right here at La Grande Épicerie de Paris. The marketplace is located at the store’s main entrance, a wondrous multicoloured island where seasonal fruits and vegetables abound. Throughout the year, different varieties become available, providing an ever-changing display of colours and flavours. Mangoes, apples, finger limes and Buddha’s hands... abundance reigns among the Rive Droite stalls! Quality, freshness and know-how are key words in the fishmonger’s section. 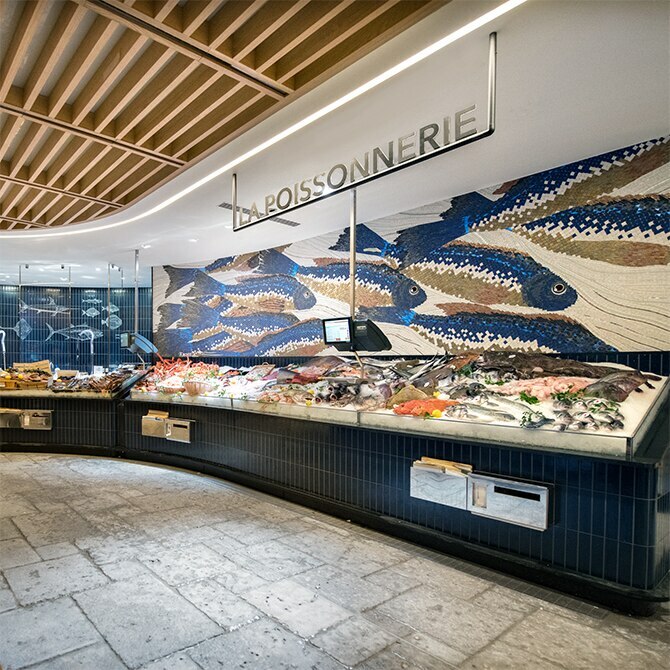 On display, you will find the catch of the day including sardines, prawns and cod, alongside upmarket fish and seafood products such as sea bass, wild sea bream and Tarbouriech oysters. Convinced that fishing techniques determine the quality of the catch, our fishmongers favour line-caught fish, arriving direct from the Vendée coast. For lovers of raw fish, discover our fish prepared according to the Japanese ikejime technique, offering a melt-in-the-mouth experience. 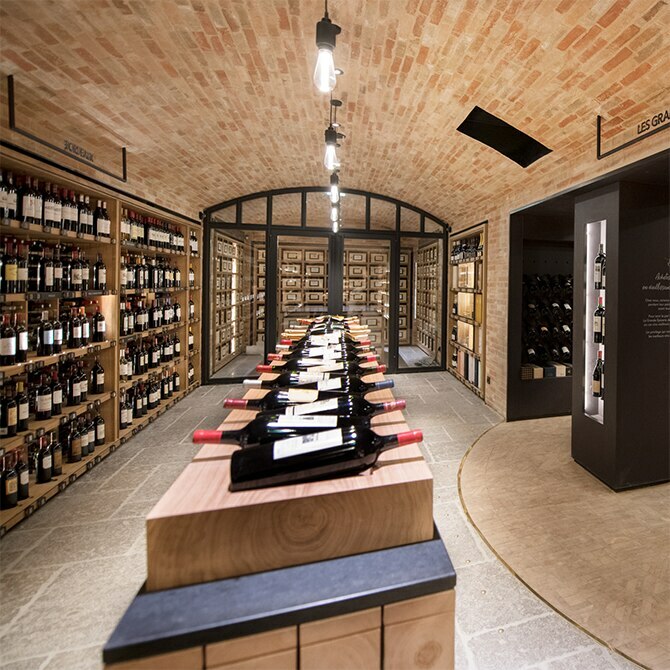 Visit the store’s basement and discover the cellar of La Grande Épicerie Rive Droite, an exceptional place bringing together an impressive selection of 1,500 wines and spirits. Consult our sommeliers, stroll with them along our whisky wall and our 40-meter-long Champagne and Grand Cru display, on your quest to find the perfect bottle for you. Our sommeliers are incredibly knowledgeable about the history of the estates and the carefully selected cuvées. They will guide you, according to your needs and taste, towards the most suitable selection for you. 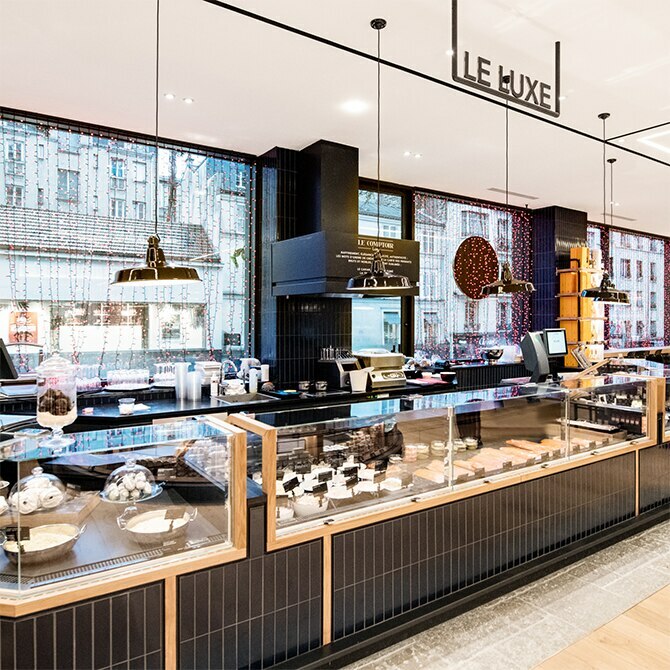 Grand Cru coffees and teas selected from the world over can be found at this specialist counter at La Grande Épicerie Rive Droite. Rosebud, mango tango… draw inspiration from our wide range of infusions, to be enjoyed hot or cold. Christine Dattner will even suggest original blends of flavoured teas, to be found exclusively at La Grande Épicerie de Paris. For the coffee lovers among you, experience our 100 % arabica Grands Crus such as our Italian black blend, Cuban coffee and Colombian supreme. Our experts carefully select our range of meats from the farmers, including some certified ‘Bleu-Blanc-Cœur’. This quality seal specifically guarantees a balanced diet for each animal. 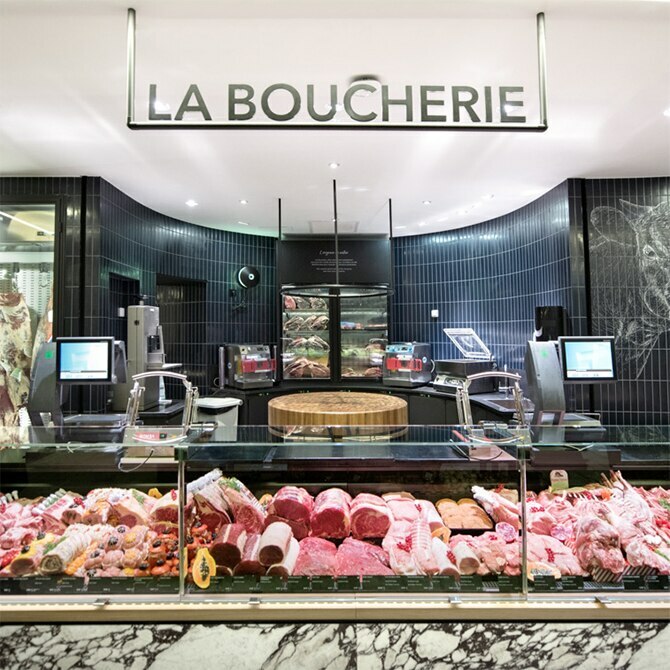 Our butchers will advise you according to your needs, recommending perhaps Mieral poultry, or protected designation of origin lamb from the salt marshes of Mont-Saint-Michel, or veal from Le Veau Sous La Mère red label range. The meat cellar also contains some exceptional matured meats, such as the Galician ribs from the Basque Country, considered among the best in the world. The aim of our master butchers is to offer our customers the best specialist meats from around the world. 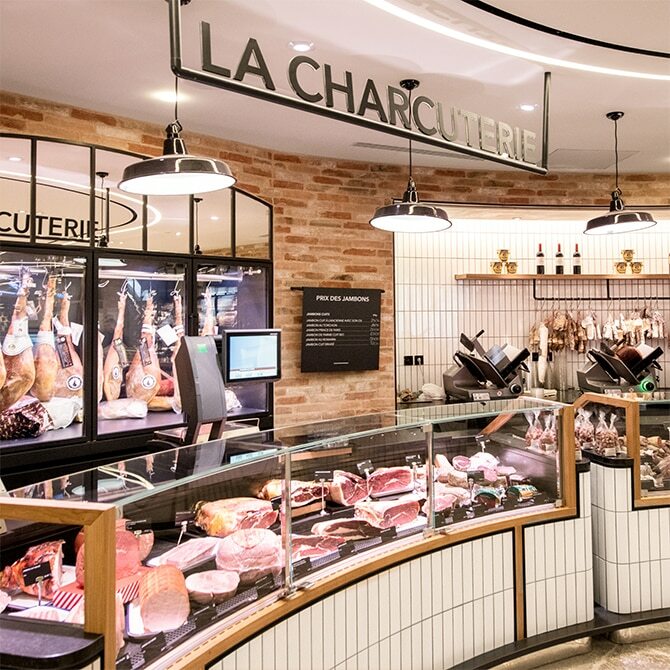 You will find a wide range of hams, sausages and pâtés showcasing prime Corsican and Italian products. Among the small producers proudly on display is Pascal Flori with his black pork charcuterie from Corsica. Serrano and San Daniele hams, and 36-month cured Parma ham, all imported directly from Italy, are also available in slices or shredded as an appetiser. Brimming with some 200 varieties selected from the world over, our beer cellar is an invitation to travel. Trappist or abbey, aged in barrels or smoked, from a top, bottom or even spontaneous fermentation process... These beers are the fruit of long, slowly perfected production methods, carried out by passionate producers. 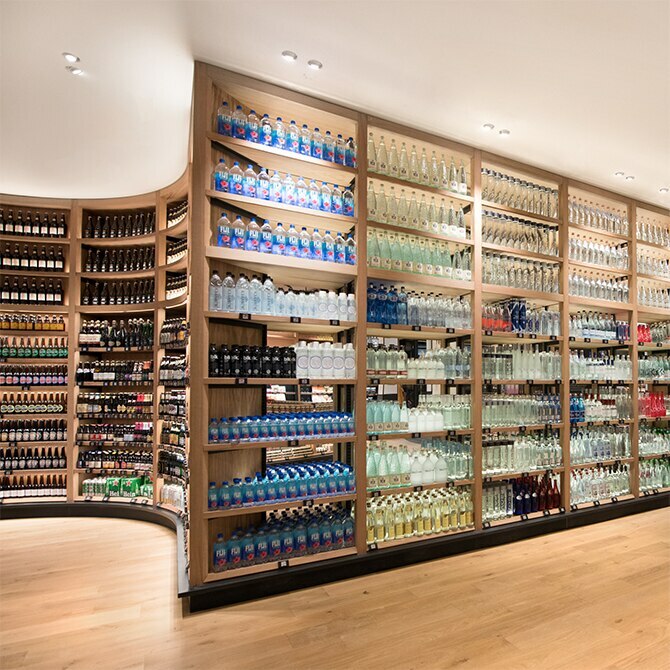 Organic juices, nectars, syrups and craft ciders complete our range of drinks and beers, not forgetting our impressive wall of water, a fresh display both on the eye and on the palate. Discover cheeses year-round from large and small producers with their own unique knowledge and expertise. 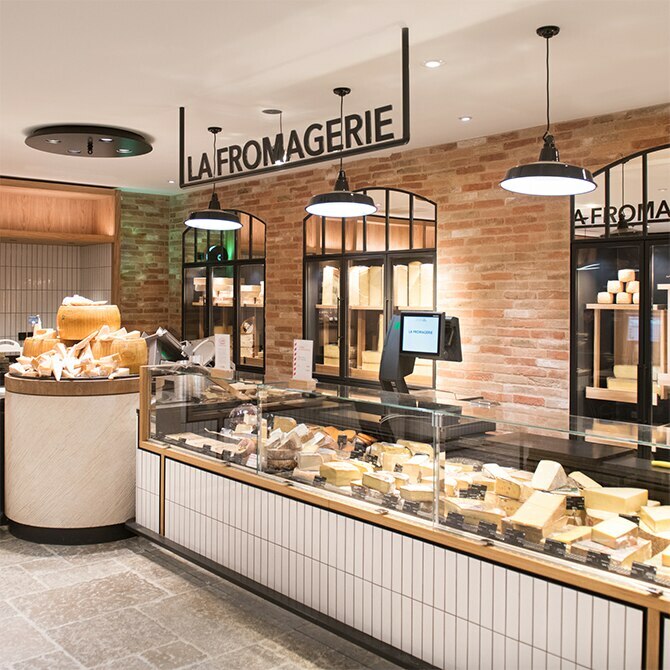 Demi-sec goat’s cheese, comté fruité or brie with truffles... you will find a wide selection of French regional cheeses on offer. We also feature a flavoursome selection from around the world, including young gouda with cumin and aged Parmesan cheese. When expecting guests, we can also help you to compile the perfect cheese platter. Choose at least five cheeses, including a hard, a soft, a goat’s, a sheep’s and a blue cheese! 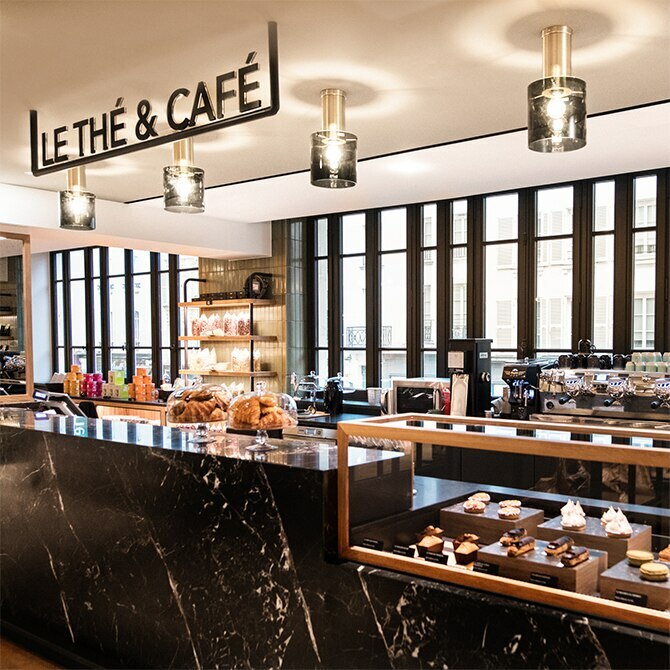 Lemon meringue pie, Saint Honoré cake, seasonal desserts... our chefs’ creations are prepared with great attention to detail and presented in all their glory at the Patisserie counter. For each recipe, our team carefully combines a number of flavours using meticulously selected ingredients. For instance, the unique aromas of Tahitian vanilla delicately flavour the pastry cream in our Saint-Honoré cakes and our vanilla éclairs. Discover our delicious speciality dishes from France and further afield, including our mezze of Mediterranean appetisers, our fish empanadas and lasagne bolognese. 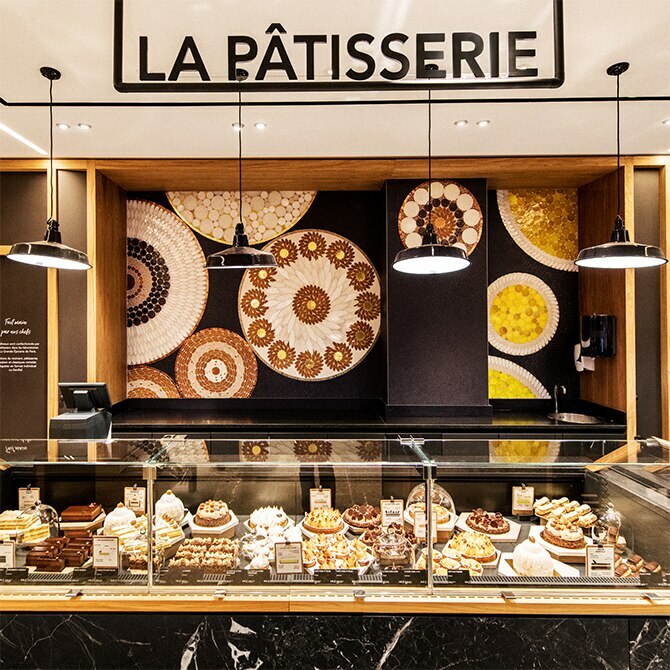 Our breads, pastries and tarts are handmade by our bakers in our Parisian kitchens. They then cross the Seine to be set out on the Rive Droite stalls. Our bakery is a great source of pride and has come to represent our hard work and attention to detail over the years. Did you know? Over 400 kilos of flour are used every morning to produce our baguettes and speciality breads. 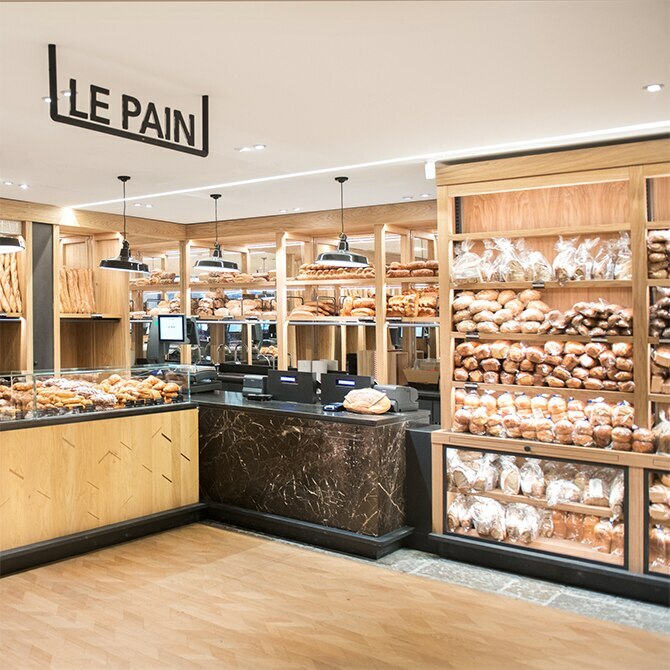 If it’s a question of trying only one, we recommend Le Grand Pain, cut in chunky slices. A selection of exclusive products are available from the luxury counter, namely salmon, truffles, caviar and foie gras. Among our wild and farmed salmon, you will find Scottish salmon from the Maison Barthouil, whose fillets are rubbed with protected geographical indication salt from Salies-de-Béarn before being smoked over Alder wood. From the land, truffles in risotto, foie gras and ravioli are among the subtly flavoured, tempting dishes on offer. Or enhance your winter recipes with a few slices of white truffle from Alba, Italy, available through November and December. Our chefs offer a range of dishes that reinvent French culinary classics, such as meat or fish vol-au-vents. For those with less time to spare, this counter also has a selection of prepared seasonal salads and sandwiches. And for those who like to finish on a sweet note, a number of tempting desserts are on offer, inspired by our pastry chefs.